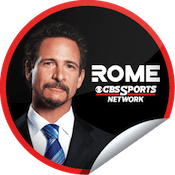 Update 9/27: CBS has officially announced that Jim Rome will move from Premiere Radio Networks to CBS Sports Radio on January 2, 2013. Rome will continue to air in the same 12pm-3pm time slot he currently fills. CBS Sports Radio today announced the newest member of its line-up for when the nation’s largest 24/7 major-market radio network launches next year. Jim Rome will serve as host of The Jim Rome Show, broadcast live weekdays from 12:00Noon-3:00PM, ET beginning on Wednesday, January 2, 2013. Also at the start of the new year, Rome will provide his unique take on the day’s sports headlines via the CBS Sports Minute, sixty-second commentaries that can be heard hourly on CBS Sports Radio affiliate stations. Rome recently signed a multi-year agreement with CBS contributing across a variety of platforms. In addition to his weekday ROME show on CBS Sports Network, he provides commentary for CBS Sports and CBSSports.com. Further, Rome will also be hosting a talk series for Showtime, which will air later this Fall on the premium network. For more than 15 years, Rome has hosted a nationally syndicated radio program, The Jim Rome Show, a.k.a. The Jungle, reaching millions of listeners nationwide. His show on ESPN, Rome Is Burning, signed off in January 2012 after airing for six years. Rome previously served as host of the popular program The Last Word with Jim Rome, broadcast nightly on Fox Sports Net, for five years. Prior to that, he spent a two-year stint hosting ESPN2’s Talk2, a nightly one-hour interview show. Rome began his radio career at KTMS, Santa Barbara as the “5 dollar-an-hour” traffic reporter and covered UC Santa Barbara’s sports. He left KTMS for San Diego’s all-sports station, XTRA Sports 690 where he created The Jim Rome Show. The show was first syndicated in 1996. In addition to his extensive sports broadcasting career, Rome has made cameo appearances alongside Al Pacino and Matthew McConaughey in Two For The Money, with Adam Sandler in The Longest Yard and opposite Michael Jordan in Space Jam; appeared in blink-182’s music video; appeared on HBO’s “Arliss;” and released a CD, Welcome to the Jungle, which features memorable sound bites from frequent callers and the hip music regularly used on his radio show. CBS Sports Radio will offer around-the-clock national sports coverage and programming, harnessing the power and resources of CBS RADIO and the award-winning CBS Sports. High-profile figures from CBS Sports, CBS Sports Network and CBSSports.com will play a prominent role on CBS Sports Radio which will reach more than 10 million listeners at launch. Original programs across multiple weekday and weekend time periods will feature expert sports commentary and interviews with major sports figures along with listener calls and fan interaction. It was previously announced that Doug Gottlieb will serve as host of afternoons (weekdays, 3:00-6:00 PM, ET) on CBS Sports Radio. Cumulus Media Networks serves as the exclusive syndicator and sales partner for CBS Sports Radio. Original Report 8/29: Deadline.com is reporting that Jim Rome is close to signing with CBS Sports Radio to move his daily syndicated show to the new network when it debuts in January. Rome has been syndicated by Clear Channel’s Premiere Radio Networks since going national in 1996 and is usually paired with Fox Sports Radio, which doesn’t program anything live in his 12pm-3pm timeslot. Rome left his ESPN television program to join CBS earlier this year. He currently hosts a daily 6pm program on CBS Sports Network and will have a second program on Showtime starting later this year. Rome’s show is a shadow of its former self – a parody of what it used to be. I wouldn’t be surprised that Premiere would want it to go away, but would be shocked if CBS really would want to build its network around it. There’s a reason that CBS dropped it in Houston (one of his early affiliates) and Clear Channel’s sports station didn’t pick it up. It’s way past its expiration date. Most of the affiliates for CBS SR are either going to be small-town stations – mostly on Cumulus’ end – or the all-local big-market sports stations, which outside of KNBR/SF and KTCK/Dallas, are all on CBS’ end. Some of those all-local outlets will be complemented by a second-tier AM signal to run the network non-stop. As some CBS SR affiliates will also have the option to carry regionally-syndicated shows (think Cumulus’ WLQR-F/Toledo, which could simulcast shows on CBS’ WXYT-F/Detroit… or Cumulus’ WBBW/Youngstown, which could simulcast shows from CBS’ KDKA-F/Pittsburgh or WKRK/Cleveland) the network schedule is likely to have a patchwork effect in some places and looks to be quite different from Fox Sports Radio’s setup or ESPN Radio’s setup. Oddly enough, the deal DOES return Rome to Houston, via KIKK/650, set to be a sunrise-sunset CBS SR outlet come January. But he will lose clearances in Cleveland (where WKNR will want no part of airing a show produced by a competitor) and LA (unless KFWB does indeed take CBS SR on a 24/7 turnkey basis). In the larger markets, they’re live, local, and making money, and the networks are used to fill late nights. I don’t see that changing. No need to give up avails to the mothership if the billing is good. Agreed. This will help them get small market or secondary clearances as well as giving possible marquee programming for the AM’s like WIP, WXYT, WJZ, KILT, and KTCT that will air the network feed 24/7.